Vectren is an energy holding company headquartered in Evansville, Indiana. Vectren’s wholly owned subsidiary, Vectren Utility Holdings, Inc. (Utility Holdings), serves as the intermediate holding company for three operating public utilities: Indiana Gas Company, Inc. (Indiana Gas or Vectren North), Southern Indiana Gas and Electric Company (SIGECO or Vectren South), and the Ohio operations (VEDO or Vectren Ohio). Utility Holdings also has other assets that provide information technology and other services to the three utilities. Both Vectren and Utility Holdings are holding companies as defined by the Energy Policy Act of 2005. Vectren was incorporated under the laws of Indiana on June 10, 1999. Vectren Power Supply is also a subsidiary of Vectren and operates coal and gas or oil-fired power stations in Indiana. Operation and ownership of the Warrick Unit 4 of the Warrick Power Plant at Newburgh, IN is shared with Alcoa. Coal for the company's coal-fired power stations is bought from Vectren Fuels, which also supplies other power companies. Edwardsport Plant is a proposed power generation plant in Edwardsport, Indiana. In 2006, Duke Energy and Vectren proposed the Edwardsport coal plant to be built in Knox County, Indiana, intended to replace two existing oil and coal plants built in the 1940’s. There is significant opposition to the plant, both because the concentration of coal generators in this area is one of the highest in the world, and because the local power needs have already been met. In May 2009, under the proposed Waxman-Markey Climate Bill, two Duke Energy plants - Cliffside and Edwardsport - are exempted from new pollution regulations. The bill has been criticized because Duke Energy helped draft the US-CAP blueprint that provided the basis for bill, and CEO Jim Rogers testified before the House Energy and Commerce Committee hearings on the bill. 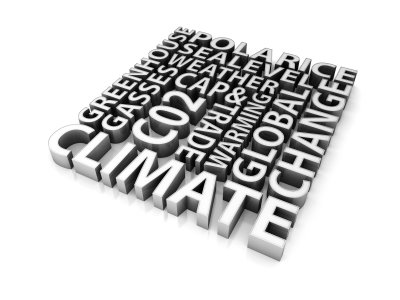 In July 2009, Duke filed a proposal for a carbon dioxide storage project with the Indiana Utility Regulatory Commission. The company would invest over $120 million to store a portion of the CO2 emissions from the Edwardsport plant in saline aquifers and in depleted oil and gas fields. The experiment would result in an average 1 percent rate increase for customers between 2010 and 2013. Duke is also applying for a federal grant to cover about half of the project's costs. If the project is successful, Duke will apply to capture and store the emissions on a permanent basis. According to its 2009 quarterly report Vectren expects that "two new underground mines located near Vincennes, Indiana are nearing completion. For testing purposes and to build the initial coal pile, minor coal extraction began early in the third quarter of 2009. Vectren Fuels expects the initial mine to be in service during the fourth quarter of 2009 with the second mine opening in 2011." On its website the company state's that "Vectren's wholly owned subsidiary, Vectren Utility Holdings, Inc. (VUHI), serves as the intermediate holding company for three operating utilities: Indiana Gas Company, Inc. (Vectren North), Southern Indiana Gas and Electric Company (Vectren South), and Vectren Energy Delivery of Ohio (VEDO)." Vectren North, which supplies gas to customers in central and southern Indiana. Vectren South supplies gas an electricity to customers in southwestern Indiana and owns and operates electric power stations to supply both its own customers and to sell into the wholesale market. On its website it states that "total generation capacity is 1,425 MW and includes 1,295 MW of coal and gas-fired generation, 30 MW of wind power and 100 MW of purchased power." Vectren Energy Delivery of Ohio (VEDO) supplies gas to customers in west central Ohio. Vectren Fuels, Inc. mines coal which it sells to coal-fired power generators, including Vectren Power Supply. 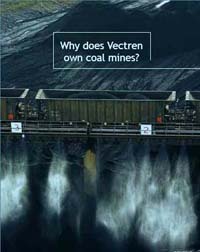 In its 2007 annual report Vectren went to great lengths to defend its expanding role in mining and burning coal. "Coal is the logical resource to generate the power needed to meet our customers’ needs here in the Midwest. With several billion tons of coal reserves available in southwestern Indiana, it’s hard to overlook a reliable, low-cost energy source sitting in our backyard ... We value local mines serving local customers and believe strongly in homegrown, Indiana energy. So strongly that we are in the process of opening two more underground mines in southwestern Indiana, which will more than double our current production ... Coal-fired plants produce more than 70 percent of the electricity generated in Indiana and the surrounding states. And with the advancements in clean coal technologies, it’s never made more sense to tap into this abundant local energy source," it states. 3. allow a three to four-year transition period before enacting the legislation." ↑ Vectren Corporation, "Environmental Stewardship", Vectren Corporation website, accessed February 2009. ↑ 3.0 3.1 3.2 3.3 Vectren Corporation, "Discover Who We Are", accessed February 2009. This page was last edited on 28 September 2009, at 15:15.